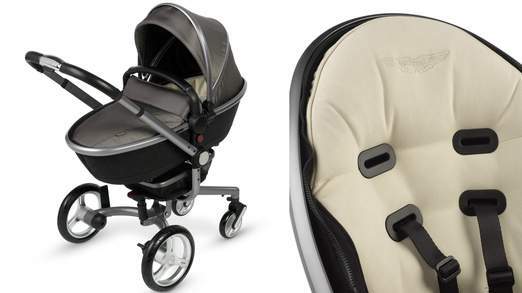 We heard last week that Aston Martin has teamed up with pram maker Silver Cross to unveil the new luxury version of the popular Surf Travel System. With its alloy wheels, Italian suede seat and the same leather used in the legendary cars, the £2,000 price tag probably isn’t that surprising. Actually you could say it’s a bargain considering it’s the closest thing most of us will get to an Aston Martin! Although an undeniably gorgeous pram, it’s fair to say that messy babies and expensive cream suede don’t mix. This got us thinking about other unusual baby products out there. But are they absolutely barmy or downright ingenious? We’ll let you decide! Ride-on Vacuum Cleaner: If housework isn’t your thing, get your children to do it. This particular vacuum cleaner allows children to sit and scoot around on it while it takes care of your carpets. Think Trunki with a motor. And utilising other members of the household needn’t stop there – to get maximum usage out of pets, how about these dusting slippers for cats? Platinum Dummy: A price tag of £54,000 for a dummy makes the Aston Martin pram look like an offer we can’t refuse. Made of solid platinum, we’re not sure how soothing this is for little ones’ soft gums! Designer Nappies: Some might say you’re literally throwing your money away by buying designer nappies. But for those with expensive taste and a penchant for luxury, designer sick bags are also available. Baby Heels: When it comes to certain things in life, it’s best to start them off young, but we don’t believe you can extend this theory to high heels. Although soft, comfortable and not designed to actually walk in, the leopard print PVC designs give them a far too grown-up feel. Baby Perfume: Although that “new baby smell” is possibly the most adorable and natural scent in the world, some parents may feel the need to cover it up with something a little more unusual. Marshmallow anyone? The Daddle: A saddle – for dads. Most toddlers love a “horsie ride” and the Daddle makes things a little more realistic. We’re sure children would love this but we feel sorry for the poor dads! Baby Crying Analyser: This innovative piece of kit claims to analyse your baby’s cries and help you understand what the problem is. We’re a bit dubious as to whether it actually works and think that nine times out of ten a mother’s instinct is all that’s needed! White Noise Player: Many adults and children alike find the distant hum of a hairdryer, vacuum cleaner or television very calming. Scientists think this love of white noise comes from the sounds a baby hears from within the womb which can be carried through its whole life. If turning your hoover on at 3am to soothe your little one sounds a little odd, a white noise player could be a more sensible option. That concludes our pick of unconventional baby products – but there are many more out there! Perhaps you even own something a little unusual and swear by it? We’d love to hear your stories – leave a comment and let us know. ← JoJo Shoots the AW13 Catalogue!